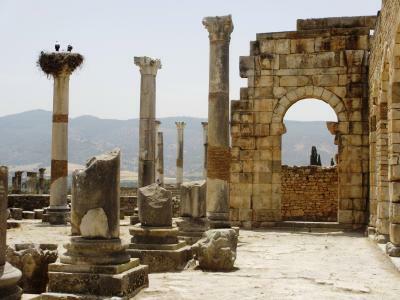 Located next to Meknes between Fes and Rabat is the excavated Roman city of Volubilis. 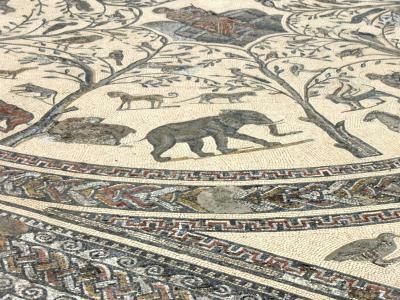 This fertile land once prospered from olive growing, which led to the creation of fine structures with mosaic floors. The Romans, Latinised Christians, and Islamic settlement all took turns inhabiting this area. 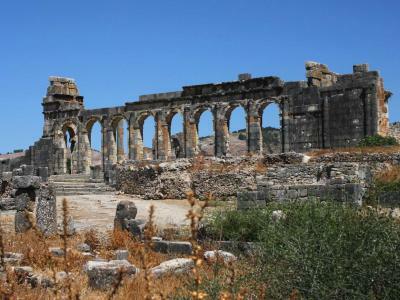 Volubilis was abandoned by the 11th century. Most of the local population relocated to the new town of Moulay Idriss Zerhoun, 3 miles away. The ruins remained until they were damaged by an earthquake during the mid 18th century, and further more when Moroccans seeked stones to build Meknes. Some of the structures were restored after the French ruled Morocco. 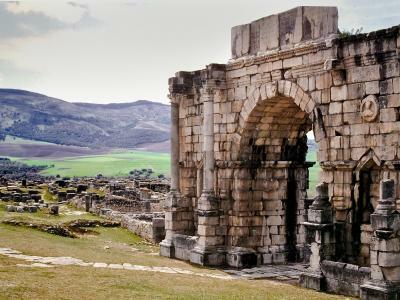 Today, Volubilis is recognized as one of the best preserved colonial towns from the Roman Empire. The Arch of Caracalla is one of the most recognizable landmarks located near the end of the Decumanus Maximus. It was built around the year 217 to honor the then emperor and his mother, Julia Domna. This structure was originall topped by a bronze chariot with 6 horses. Nymphs poured water into marble basins below. This monument was restored during the 1930s. There have been disputes about the accuracy of the restoration.